The company claims its air conditioners will use as much power as a fan. Welcome to the arcane, yet significant, world of cooling. Why buy a fan when the air conditioner uses as much power? That will be the sales pitch for a new line of residential air conditioners coming from Coolerado. The Colorado-based company plans to release a version of its light industrial air conditioner called the M30 for homes this fall that will consume only 450 watts, or about as much as a ceiling fan and way lower than conventional home air conditioning systems which can gobble 4,000 watts. The M30 is designed to cool 1,500 square feet of space or less. Following that, it will then fashion a system that will work in the Eastern U.S. The M30 uses water vapor to cool rooms but it does not extract water vapor out of the cool air injected into a room. Hence, the target market has been the mountain states and the west coast. "It cools, but it does not dehumidify," said Rick Gillan, executive vice president of marketing. "As soon as you get to Nebraska or Kansas, you need dehumidification." Adding dehumidifiers to the systems will increase the power consumption, but the company expects that its units will consume less than half of the power of standard air conditioners. Although you rarely see CEOs of innovative air conditioning companies mingling with celebrities at film festivals, it's a big topic. Air conditioning is one big energy hog. It comprises 50 percent of the demand for power during peak periods in California, according to various estimates, and the figure is around 30 percent nationwide. In all, air conditioners gobble up around 5.2 percent of the total energy in the U.S. and about 10 percent of the electricity. (Building operations account for around 39 percent of U.S. power according to the Department of Energy and 13 percent of that power in residential and commercial buildings goes to air conditioners.) Not only are air conditioners themselves inefficient, the sensors and other mechanisms often aren't networked property for dynamic control. Walk around your building and count the female co-workers who are wrapped up in Snuggies sometime. Some of the ideas to crimp down on AC power include: solar air conditioners (Chromasun), magnetically levitated compressors, computer controlled misters (AC Research), desiccant coolers (gel shifts from solid to vapor and back to remove heat) and thermal mass coolers, in which ice created at night serves to cool large buildings during the day (Calmac, Ice Energy.) In some cities like San Francisco and Seattle, architects are also exploiting passive, ambient cooling to leave out the AC unit entirely. Coolerado's system is based around the Maisotsenko Cycle. In a nutshell, outside air is cleaned, mixed with mist and run through a series of heat exchanging plates. The misty air extracts heat from the interior air before being cycled out. The company recently won the Western Cooling Challenge sponsored by UC Davis by demonstrating a commercial air conditioner at a big box retailer that consumed less than 50 percent than normal. The units cost about 25 percent more than standard air conditioners but in many areas utilities will provide rebates, he added. 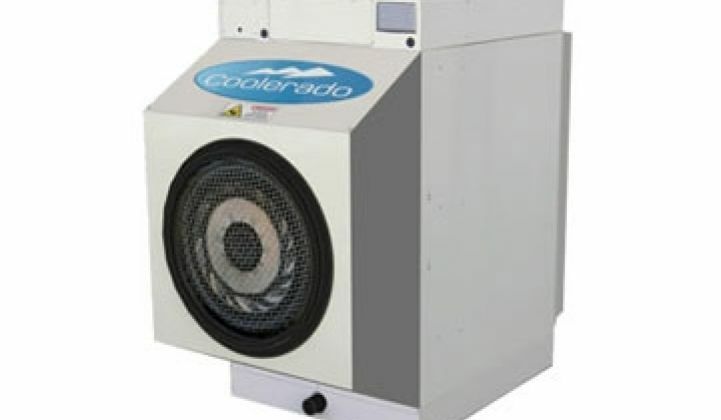 Image of the Coolerado M30 via the company.